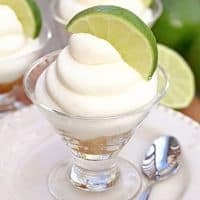 KEY LIME PIE MOUSSE — This light, refreshing citrus dessert tastes like your favorite key lime pie, but it’s ready in a matter of minutes! Serve in mini dessert dishes for an easy but elegant dessert everyone will rave about! 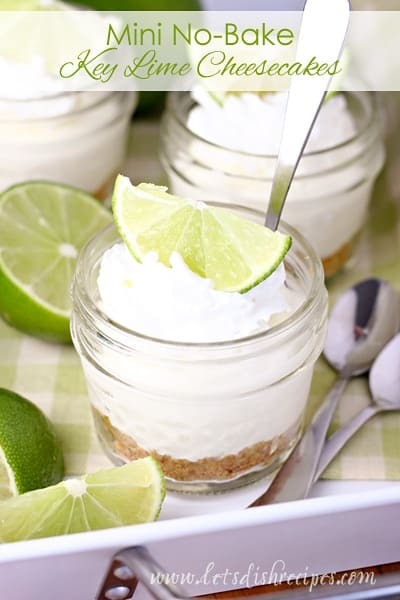 If you’re a fan of key lime pie, then you’re going to love this Key Lime Pie mousse! Besides being smooth and creamy, it’s the perfect blend of sweet and tart deliciousness. Even better, this has to be one of the easiest desserts I’ve ever made! The mousse is made of just 3 simple ingredients that you can whip up in minutes. I like to serve this mousse in mini dessert dishes, but small Mason jars are fun too. I can get 10-12 small servings from this recipe, but it really depends on the size of serving dish you use. For a gluten-free version, simply omit the graham cracker crust. 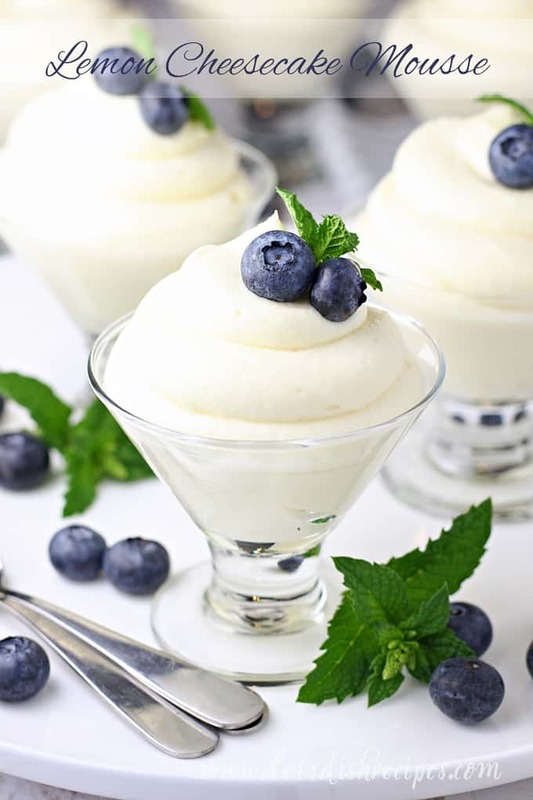 I like to garnish this mousse with lime wedges, but it’s also pretty and delicious served with fresh berries and mint. 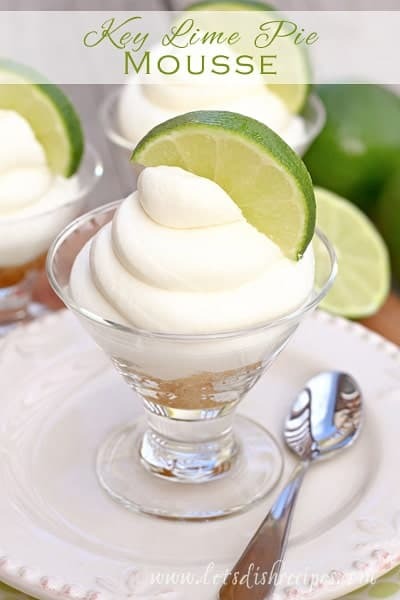 No matter how you serve it up, this heavenly lime mousse is a perfect spring and summer dessert! This light, refreshing citrus dessert tastes like your favorite key lime pie, but it's ready in a matter of minutes! Serve in mini dessert dishes for an easy but elegant dessert everyone will rave about! In a small bowl, mix together graham cracker crumbs, sugar and butter. Divide crumb mixture evenly between 8-12 small dessert glasses. With an electric mixer, beat cream until stiff peaks form. In a separate bowl, whisk together sweetened condensed milk and lime juice until smooth. Fold lime mixture into whipped cream until well blended. Pipe or spoon mixture over graham cracker crumbs. Refrigerate until serving. Garnish with fresh lime wedges, if desired. Total time does not include refrigeration. Hi Danelle! This looks delicious and so refreshing for a hot day! Now this is my kind of dessert. Have always had success with your desserts so I know this one will be a winner also thanks for this Danelle. 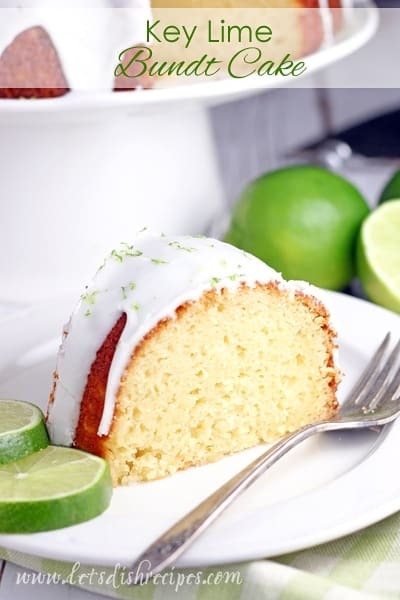 I love key lime and this looks terrific. Nice post! I’ve never had an issue with that. It’s a pretty common combination in lemon and key lime pie recipes. The sweetened condensed milk just doesn’t react the same way as regular milk, so it should be fine! I did not have any curdling issues. This was excellent!!! We made this for a recent beach trip and used animal crackers for dipping. This is my new go-to dessert. It’s simple and delicious! This was delicious! So very rich and fruity. I was excited to make it for my St Pat’s bunco. It was a hit! I’m thinking of experimenting to adapt this for chocolate mousse. Awesome, thank you! If you come up with a chocolate version, I’d love to hear about it. Or, the Easy Chocolate Mousse recipe on my site is truly easy and never fails me. Good luck! Years ago, I was taught a fail-proof chocolate mouse, just like this. Beat a pint of heavy or whipping cream to stiff peaks and fold in one bag of melted and cooled semisweet chips. Chill immediately. Your recipe has become one of my “go-to” quickies for dessert. When serving guests who are gluten-free, i substitute almond or coconut flour for the Graham crackers. Most of the year we have an abundance of Key Limes from our tree so its a perfect way to use them. 5/5! Thank you! It’s my go-to gluten free dessert as well. So glad you like it! Served this last night at a dinner party. Everyone loved it, a perfect dessert for a hot summer evening and I don’t think I have ever made a dessert recipe as easy as this before. Just made this with Mexican limes my husband bought at the supermarket. So delicious! I actually left out the Graham cracker crumbs to save a calorie or two and we loved it. I wonder how far in advance can you make this without it collapsing or separating?